How comfortable would the ride really be inside a Concord stagecoach? I got to find out first-hand in New Mexico. I wasn't sure if I brought into Ed Heimann’s claim that the Concord is the “Rolls Royce” of horse-drawn vehicles. When I spend long days in the saddle, I certainly feel it. Sitting for long hours on international flights also makes me stiff. But Heimann, owner of the Lincoln County Overland Stage Company (now-defunct), promises this egg-shaped vehicle is a surprisingly nice ride—especially after a few days, when one gets used to the swinging motion. 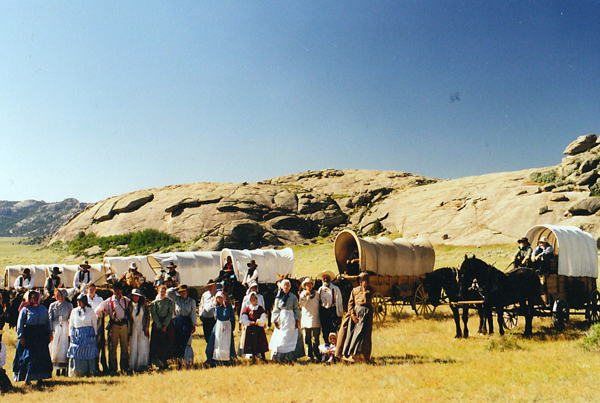 The Concord Stagecoach in New Mexico on the Ozanne Trail, which once connected Fort Stanton with the village of Lincoln. 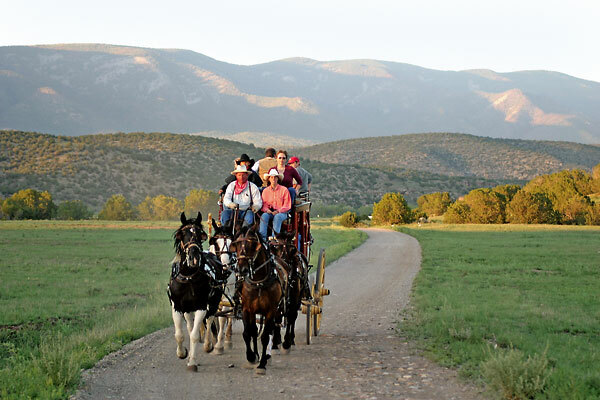 To test out his contention, our group traveled with Heimann in his deep red Concord stagecoach with four horses pulling us along New Mexico’s Ozanne Trail, a spur line of the Old Santa Fe Trail. Concords can seat nine people inside, with room on the rooftop, a spot where you definitely have to hold on! While the leather bench seats inside were hard, the ride was smoother than I had imagined, especially in the seat beside the driver, the most coveted stagecoach seat. This position might sometimes have been taken by a guard with a shotgun, on the lookout for robbers, Indians and other nefarious characters. The shotgun guard might also have rested on the roof of the coach, always alert to possible danger that might harm his passengers or freight. The Concord’s design in particular made it special. Built in 1827 in Concord, New Hampshire, with thick leather thoroughbraces—hammock-like support straps—the carriage could rock back and forth instead of bouncing up and down on metal springs. (Mark Twain called it a “cradle on wheels,” in his 1872 book Roughing It.) Today, getting to ride in an authentic stagecoach is something special. 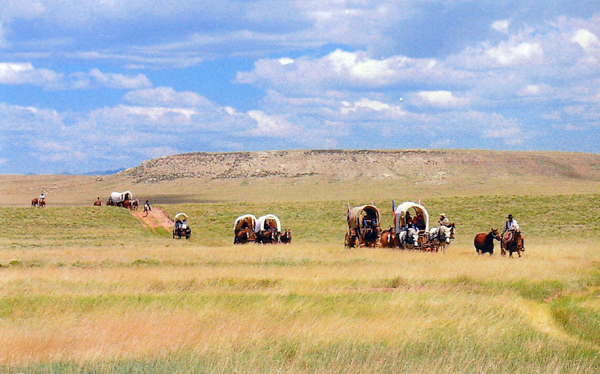 Wagonmaster Ben Kern's train on the Cherokee Trail near Colorado. In Ed’s luxury Concord, I stare at the sun setting behind the beautiful Capitan Mountains, imagining the settlers and outlaws who might have seen this same scenery on their travels in the 19th century. Depending on the weather and road conditions, travelers may or may not have been able to enjoy the views. While my short ride was pleasant, travelers of old would have experienced many pitfalls. Besides dusty, bumpy roads, extreme weather and the threat of robbery and attacks, passengers had to deal with ... well, other passengers. In the old days, stagecoach routes had rest stops in 10- to 15-mile increments—just like our modern-day rest stops and gas stations. These stations allowed travelers to stretch and walk around a bit, grab a quick meal or use nature’s privy. 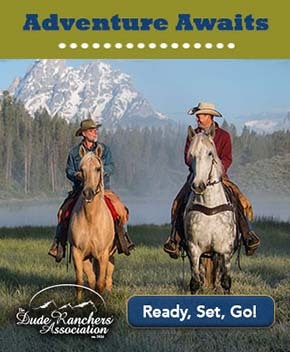 Drivers might change out their horses, getting fresh steeds to continue a good pace for their journey. While some stops had kitchens and beds, many coaches kept rolling through the night, forcing passengers to sleep sitting up. While I wore my cowboy hat with Ed, I might have worn a sunbonnet on a ride with Ben Kern. Kern urges his passengers to dress authentically on his journeys. He has taken folks on multi-month journeys along the route from Cheyenne to Deadwood, the Oregon Trail and the Bloody Bozeman Trail. He travels in the State of Wyoming’s mud wagon stagecoach, which is smaller and lighter than the Concord’s, making it more suitable for travel on rough roads. It also has no doors but instead, canvas curtains. Ben Kern says that his groups really bond during their time on the trails. I would imagine they do, just as travelers would have in the past. Riding in a stagecoach, even a higher-end Concord like Heimann’s, has helped me get the true picture of the trials and adventures in traveling America’s historic highways. 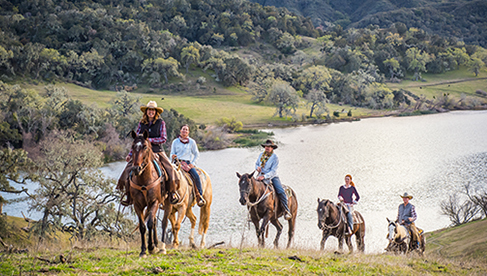 Now when I’m crammed in an airplane, subway or bus, I think about the gold seekers and pioneers together for months at a time as they took on the bumpy trails in their horse- and mule-drawn vehicles, conquering the West.